How many of you enjoy your dry fruits, nuts and seeds? I'm talking raisins, sultanas, dates, apricots, prunes or almonds, cashewnuts, peanuts and also pumpkin seeds (pepitas) and sunflower seeds. Me, I love them all. They are all known to have health benefits if eaten in small quantities as part of a balanced diet. It is a shame that more people don't include these little gems in the diets. My husband loves nuts, but isn't too keen on the dried fruit or seeds by themselves. So I have to think of ways to include them in our diet. Most often, we usually just nibble on a small handful of an assortment of fruits and nuts / seeds, but I was looking for other ways to enjoy them too. When I came across a post with these bars, I knew I had found something good. 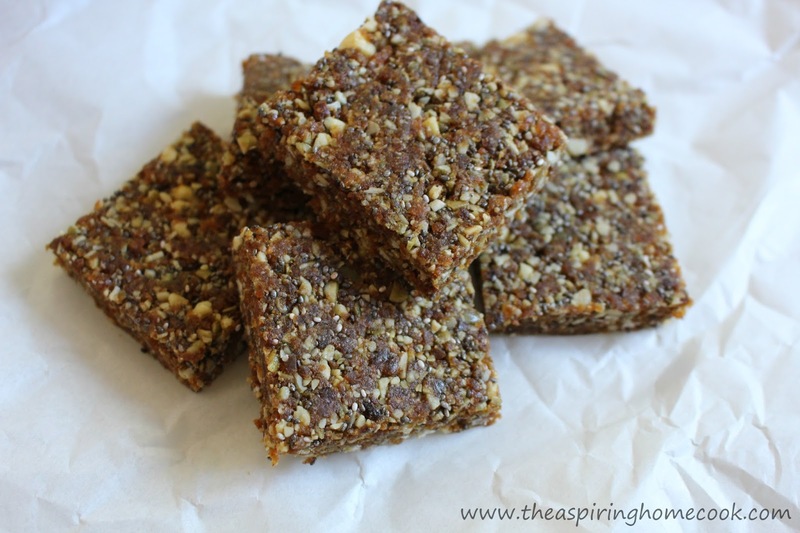 It has dates, apricots, pepitas, chia seeds and a touch of cinnamon, all of which are know to be healthy in their own right. They come together to form these little delicious bars which are so tasty. They are sweet from the dates, a little tangy from the apricots and have the crunch of the chia seeds and pepitas though them. As the original recipe included a small amount of white chocolate chips, I threw them in, but they would be fantastic even with dark chocolate or even without chocolate at all. The verdict, my husband enjoys them, which is a win for dry fruits in his books. They are small portion sizes, but pack a punch. If you like to reach for a snack bar or a granola bar during the day, I suggest trying these out. They are very satisfying and will keep the hunger pangs away till your next meal. They take all of 10 minutes hands on time. So even if you are time poor, you can still make a batch of these on your day off and enjoy them through the week. Kids will enjoy them too. Go ahead, give them a try. If you do, I'd love to hear what you think of them. Line an 8x8 inch baking dish or tray with baking paper. Place the dates, apricots, chia seeds and cinnamon in a food processor and blitz till it has coarsely broken down. Add the pepitas to the processor and blitz again till the pepitas have broken down to finely chopped. Now add the chocolate chips, if you're using them and blitz again to break them up to little pieces. Empty this mix onto the lined baking dish and flatten it down as best as you can, using the back of a spoon. Next, I used another piece of baking paper on the top and used a large glass jar to flatten it out evenly. You can also use the bottom of a pan or a similar sized baking dish to do this after you place the baking paper on top. Cut into squares. They are now ready to eat. To store these bars, place a piece of baking paper between the squares to keep them from sticking to each other. Store in an airtight container in the fridge. You now have little snack bars that will take you through the week.